In this post you can find how to rewrite or repair your IMEI number on your android device (phone or tablet). In some cases when your android device got bricked, after repairing it you might face issues with SIM network because of invalid IMEI on your android. There are many reasons behind it. 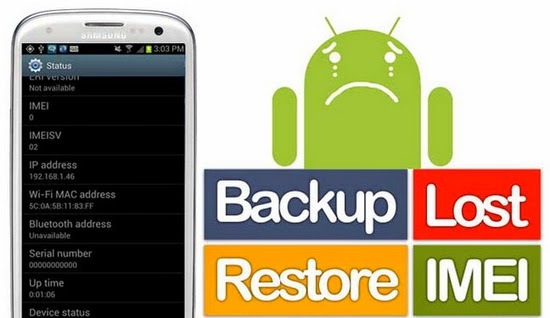 In order to fix this issue you can read the below guide to repair imei on android. Note : This guide is only to repair your android phone using your already existed imei number which you got along with phone, but not to change it. Changing imei is illegal and we don’t support that. In order to do this, your phone must be rooted already. You are going to do this through Engineering mode in your android device. You can use the below secret code in engineering mode to rewrite old IMEI on your android. Now you have to tap on callpad or connectivity or slide the screen. Now find CDS information option. CDS stands for Common data service. Once you found it, you’ll see Radio Information option there, just tap on it. If your phone is single sim, then you’ll see one option there, and dual sim users will see 2 options there like Phone 1, Phone 2. Write your IMEI code there like in this format : “AT +EGMR=1,7,”your imei code here” and “AT +EGMR=1,10,”your imei code here” . Example: “AT =EGMR=1,7”9000XXXXXXXXXXXX” After that tap on send command button. That’s it.